Richard Stöhr (1874–1967) was a prolific and highly respected Viennese composer, author and teacher. His output includes seven symphonies, two operas, choral music, lieder, numerous chamber works and solo piano music, as well as half a dozen widely used textbooks. During his 50-year career as a teacher, his students included Herbert von Karajan, Erich Leinsdorf, Rudolf Serkin, Samuel Barber, Leonard Bernstein and Marlene Dietrich. After he was forced to leave Austria by the Nazis, he continued his composing and teaching career in the United States, but sadly his later compositions went unpublished and have been rarely performed. This site is dedicated to introducing and championing Stöhr’s works to modern performers and audiences. 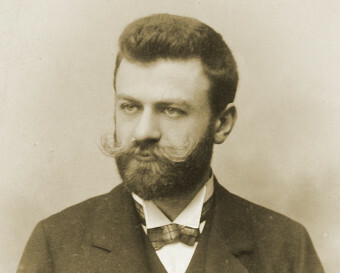 Richard Stöhr (1874–1967) was born in Vienna in the same year as Arnold Schoenberg. Stöhr obtained an M.D. degree from the University of Vienna, but immediately entered the Vienna Academy of Music as a composition student of Robert Fuchs. After earning a Ph.D. in Music (1903) he was soon teaching courses in theory, composition and the history of music, and coaching chamber music. Upon Fuchs’ retirement in 1911, Stöhr took over his most advanced courses became a full professor at the Academy in 1915. Following the Anschluss in March 1938, Stöhr was identified by Nazi officials as a Jew and fired from the Academy of Music. In February of 1939 he emigrated to the United States and was hired by the Curtis Institute of Music in Philadelphia to teach courses in theory and composition. When Curtis downsized their faculty in 1941, Stoehr quickly found another position at Saint Michael’s College in Colchester, Vermont. Stoehr continued to compose prolifically during his years in the U.S. in all major classical genres except opera. While virtually all of his compositions prior to 1939 were published by reputable firms including Universal-Edition, none of the numerous compositions from his U.S. years were ever published. During his 50 year career as a teacher his students numbered in the thousands and included Herbert von Karajan, Erich Leinsdorf, Rudolf Serkin, Samuel Barber, Leonard Bernstein and Marlene Dietrich. Richard Stoehr died in December, 1967 in Montpelier, Vermont and is buried in Merrill Cemetery in Colchester. The site includes numerous documents from Stoehr’s life including downloadable scores, diaries, books, correspondence and more. View images including family photos, formal portraits and candid shots from all phases of Stoehr’s life .